Aute, Possibly from PROTO POLYNESIAN *Kaute, Hibiscus rosa-sinensis, "Hibiscus" (Malvaceae), but that word, from an earlier Eastern Central Pacific *Kaute (Hibiscus sp.) is reflected with the Proto-Polynesian meaning in Tongan, Samoan, Tahitian, Rarotongan and many other Polynesian languages (excluding Hawaiian and NZ Māori). Like the aute, the bark of many Hibiscus species is suitable for making paper-like fabric. 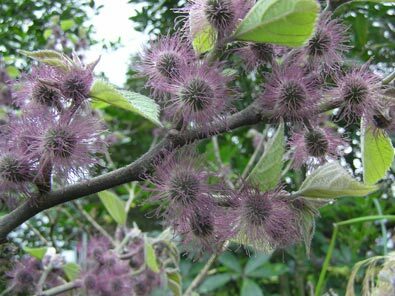 Māori: aute (Broussonetia papyrifera, "Paper mulberry", Moraceae and cloth and other products made from the bark of the tree.) Also Pimelia longifolia (Thymelaeaceae) and Hebe diosmifolia (Plantaginaceae) - see notes below. Proto Polynesian : *Kaute (Hibiscus rosa-sinensis, "Hibiscus", Malvaceae). See note at the beginning of this page. Proto Polynesian: *Malo "Barkcloth loin garment"), from Proto Malayo Polynesian *maru, "Tree whose bast is used for barkcloth", through Proto Central Eastern Malayo Polynesian *malaw and Proto Oceanic: *Malo "Paper mulberry", Brousonetta papyrifera; barkcloth, loin cloth". See notes below. 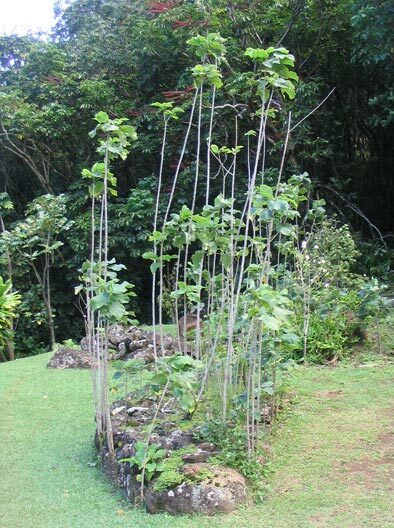 Proto Eastern Polynesian: *Mata-Siapo, "Firstborn", from Proto Polynesian *Siapo (Broussonettia papyrifera, "Paper Mulberry", Moraceae). See notes below. The aute is a "canoe plant", carried by the Polynesian voyagers throughout Polynesia, probably picked up by their Austronesian forebears in the New Guinea area after they had left the Philippines (although the plant is present in Taiwan, and indeed is cultivated as far north as Southern Japan). Despite its importance in Polynesian cultures, this tree has undergone changes in name at various points of the journey, before it arrived in Polynesia and then within Polynesia itself. The oldest of these words is *malo, once a generic term for trees whose bark yielded material for cloth, and which during the sojourn in the Bismarck archipelago came to mean the aute and its products. By the time it reaches Fiji, this word has come to mean a loin cloth, skirt or kilt, a meaning retained in Samoan (malo), Hawaiian (malo), Tahitian (maro), Marquesan (ma'o), Rarotongan (maro) and Maori (maro), along with many other Polynesian languages. 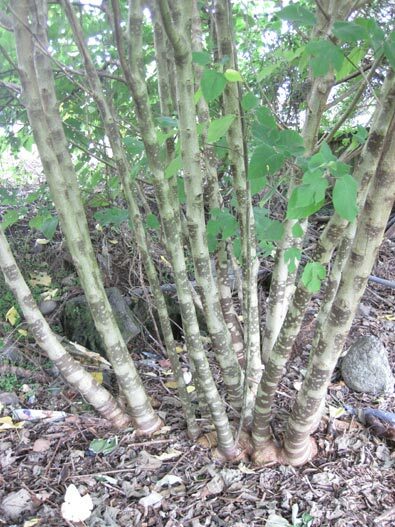 As the generic term for Broussonetia papyrifera and its products, *malo survives as far as Fiji (the contemporary Bauan term is malo), but is replaced by *siapo in Proto Polynesia. It is retained with this meaning in Tongan and Niuean (hiapo) and refers to the cloth made from the aute in Samoa (siapo), where the tree itself is referred to as u'a. That word ceases to be a plant name in Eastern Polynesia, but is retained in the derived form *matasiapo to denote a first-born child whose birth would have been greeted in distant times and places, at least, by gifts of specially crafted fabric, probably made from the bark of the aute. This meaning is retained in Hawaiian (makahiapo), Rarotongan (mata'iapo), Tahitian and Tuamotu (matahiapo); in NZ Māori the meaning shifts a little fiurther, and matahiapo becomes a generic term for precious or prized. Tapa cloth wall hanging, National Museum, Apia, Samoa. 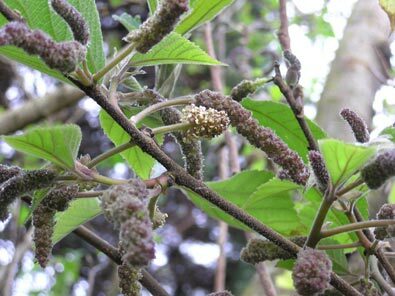 Although the first East Polynesians would either have brought the paper mulberry with them, or acquired it shortly afterwards from their western homeland, they adopted a completely new name for it, *aute, which survives in East Polynesian languages to denote Broussonettia papyrifera, as aute in NZ Māori and variants of this in other contemporary languages (see the list of reflexes, above). The plant would not have made it alive to Aotearoa by ocean-going canoe without considerable care -- as Elsdon Best points out (Maori Agriculture, p. 19), the presence of plants such as this is a sign of a deliberately planned settlement. Recent research has highlighted the aute as an excellent indicator of the course of Austronesian migration from Taiwan to Polynesia and elsewhere in the Pacific (see the "Further Information" section at the end of this page). 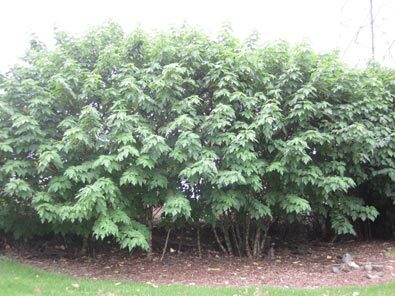 The aute is a shrubby tree with the lower parts of the stems and branches usually bare, potentially forming extensive clumps, and growing between 5 and 10 metres high. The oval leaves vary in shape, sometimes undivided and tapering to a point, at other times the oval leaf may divided like the palm of a hand with between two to five lobes, also oval and tapering. The tree has a bark which provides excellent fibre for making paper-like cloth (tapa), which is why the plant was carried throughout the Pacific by the first settlers. It is native to China and Japan, and possibly also to Burma and Thailand. 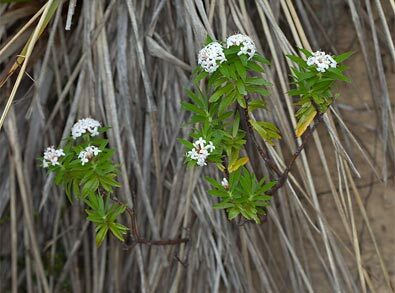 It has separate male and female flowers, borne on different trees, but was generally propagated by cuttings in Polynesia as even in Hawai'i female plants seldom if ever bore fruit. 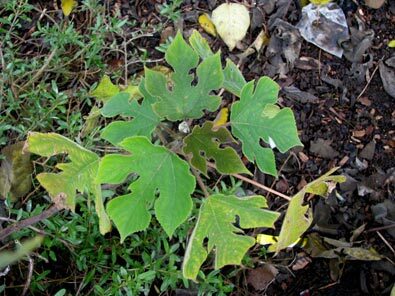 In Aotearoa, aute was introduced in the early stages of settlement: Te Rangi Hiroa notes that it was one of the plants brought with her and cultivated by Whakaotirangi, the wife of Hoturuoa, Captain of the Tainui canoe. The tribal god Ihungaru, brought from Hawaiki to the Rotorua area at much the same time on the Arawa canoe, was represented by a lock of human hair braided with aute bark. Haere mai ki Hauraki, ki te aute tē awhea. 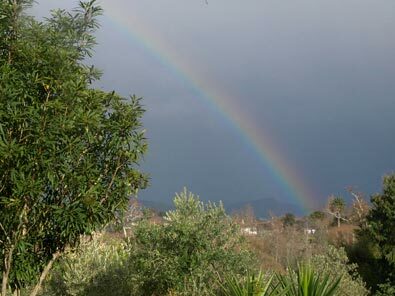 This characterizes Hauraki as a safe and tranquil destination. After the bark had been beaten into cloth, the aute had to be allowed to dry in a still place where it would not be blown about by the breeze or subjected to sudden gusts of wind. In other words, there's not enough to make something to wrap around the body: the resources are inadequate. As it became rare, the cloth came to symbolize high status and chieftanship; even a headband of aute was a sign of high rank. He aha koa au ka mate, tēnā te aute i whakatōkia e au ki te tara o te whare. This saying is attributed to Pokere, a great Ngati Whanaunga chief, before he was killed by Ngapuhi, indicating that his family would survive to avenge his death. Kei a Te Roruku mā. In Aotearoa the name has also been applied to two other plants; unmodified to Hebe diosmifolia, and qualified as aute tāranga to Pimelia longifolia. The Pimelia was the source of fibre for an inferior kind of cloth, hence the name. The case of Hebe diosmifolia is more difficult to solve. The only apparent resemblance of this small Northland tree to the Broussonettia is its slender, leggy trunk, and that may indeed have earned it the Māori name. It has no other! Further information : There is information about the aute in Te Rangi Hiroa (Sir Peter Buck)'s The Coming of the Maori, and also passing reference in Elsdon Best's Maori Agriculture and botanical information in Wagner et al. Manual of the Flowering Plants of Hawai'i. Three recent papers underline the importance of aute in tracing the course of Austronesian migrations from Taiwan to Oceania: Chi-Shan Chang et al., "A holistic picture of Austronesian Migrations revealed by phylogeography of Pacific paper mulberry" (2015); Elizabeth A Matisoo Smith, "Tracking Austronesian expansion into the Pacific via the paper mulberry plant" (2015), and D Seelenfreund et al., "Paper mulberry (Broussonetia papyrifera) as a commensal model for human mobility in Oceania: anthropological, botanical and genetic considerations" (2010). (See Bibliography for publication details). There is also a summary of the traditional use and significance of aute, with some additional references, on the LandCare web site. Photographs: We are grateful to Mike Wilcox and Mike Theisen of the NZ Plant Conservation Network for permission to use their photographs of New Zealand-grown aute; the Hawaiian and Samoan photos are by R.B., Te Māra Reo.